The QCS scale is best for counting pull tabs (also known as tickets). Pull tabs are usually counted in heavy lexan containers. The QCS higher weight capacity allows for taring out the weight of these containers while maintaining accurate counts." Accumulation Memory Feature maintains a running subtotal of the total count up to 999,999. Tare Feature lets you count items in a box, tray, bucket, or carton. Available in several different weight capacities depending on your particular counting needs. AC or battery operation (included) for complete mobility. Perfect for labels, envelopes, business cards, tickets, etc. Optional Laminate Platter enlarges the work surface to 11.5 x 18"
Perfect for small size parts of any type: metal, plastic, fiber, etc. including springs, screws, hardware, beads, electronics, etc. 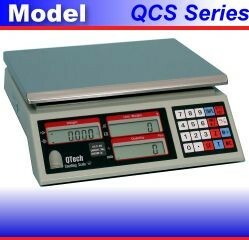 The QCS-3, with its 1 part in 2 million internal resolution and .0001 display resolution, can count extremely small and/or light weight items. Compact design and internal battery operation is perfect for route collections. Platter Size: 9 x 11"